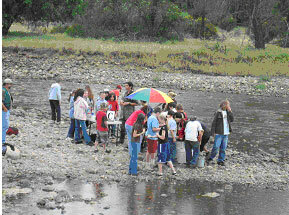 The Upper Putah Creek Stewardship is proud to announce our 12th annual In the Creek Day. Fourth Grade Classes from all schools in our watershed are invited to Creek Day to experience their watershed as they attend several knowledge building stations that provide enlightenment on topics such as: geology, biology, botanical and watershed processes. Your forth grader will be bringing home an invitation soon! The Upper Putah Creek Stewardship has been monitoring steams of our watershed for over four years The testing method used is called "bioassessment". During this process, benthic marcroinvertabrates - aka "bugs" are collected. The presence, condition and numbers of the types of bugs are data that can provide direct, accurate information about the health of our streams. Join us in the creek for a day or become a citizen monitor and become part of our assessment team! The Upper Putah Creek Stewardship is in the process of developing a formal watershed assessment. “Watershed assessment” is one method used to understand a watershed. It is a process for evaluating how well a watershed is functioning. Watershed assessments may include identifying important issues, examining historic conditions, evaluating present conditions and processes, and determining the effects of human activities. A complete watershed assessment will inform decisions being made in the watershed. 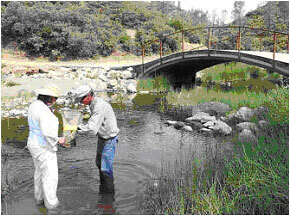 (For more watershed assessment information visit http://cwam.ucdavis.edu ) The Upper Putah Creek Stewardship will be hosting three assessment planning meetings over the next 18 months. We welcome your participation! 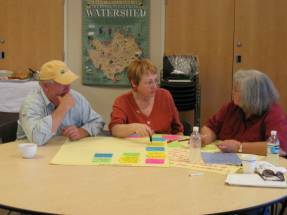 The Upper Putah Creek Stewardship welcomes your contributions during this year’s Watershed Strategic Planning 2 day event. This opportunity is open to county officials, scientists, educators, residents, stakeholders, UPCS board and employees. The Stewardship needs your help to determine priorities for future projects throughout your watershed ~ The Upper Putah Creek. 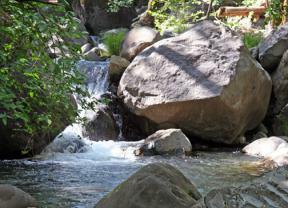 Please participate in creation of a well balanced strategic plan for the Upper Putah Creek Stewardship. Your input is important to us.